We want you to say, "I KNOW MY FARMER!" HBF farmer-owner Rob Schacht (better known as "Digga”) studied natural resource management in college, which eventually led to his journey as a farmer. While rebuilding the original homestead of the current property, Digga often admired the beautiful fields across the street; he realized that he could live his passion for good food and love of the outdoors. So, he became a farmer! To support the farm’s development, Digga worked in special education and construction, eventually establishing and owning a contracting business. When he’s not on the farm, Digga enjoys good food, fishing and spending time his family. Teresa is the owner-farmer of HBF. While she officially got into farming in 2001 after marrying Dig, Teresa has always had a passion for food. She is a certified master-gardener through UConn, and served as the farmer-vendor coordinator for CT NOFA’s Taste! Organic event from 2002-2007. When she’s not chasing after Sam (the resident farm kid!) or trying to keep her husband on task, Teresa enjoys hiking, kayaking, live theater and folk music. She is also a licensed massage therapist, and a 1989 graduate of the Connecticut Center for Massage. Nicole is originally from Pittsburgh, PA. She graduated from Penn State University with a degree in Wildlife and Fisheries Science in 2004. 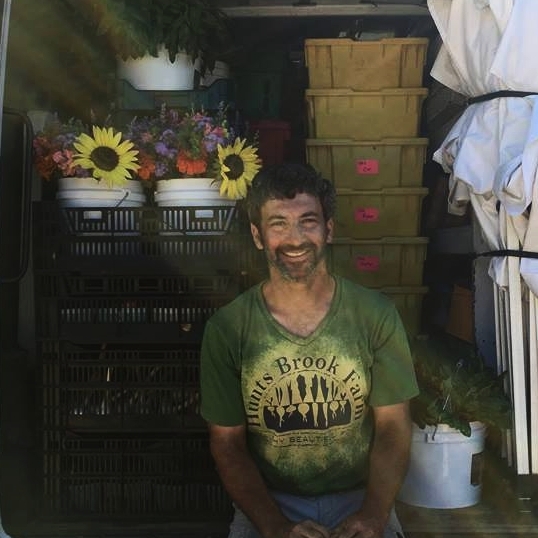 She found her love of farming in 2005 when she started apprenticing at Riverbank Farm in Roxbury, CT. She also found her husband there in 2007. She spent eight seasons at RBF, and, after her second season, she spent the winter apprenticing at Worden Farm in Punta Gorda, FL. She joined the Hunts Brook Farm crew in 2011. In her free time, Nicole is a mama to two very high energy children. When she is not totally exhausted from chasing the little man around and working, she may find the energy to knit, needle felt, sew and cook. You can find her work at ColeMama Creations. Otherwise, at the end of the day, you will find her lying on the couch watching movies. Boss is the resident, friendly farm dog. You'll find him basking in the sun, resting in a bed, or giving you a friendly lick hello. Boss is always game for a ride on one of the farm's golf carts, a nibble or two on a farm-grown carrot, and, on really hot days, a dip in the farm's quarry pond.